Jennifer's Blog » Blog Archive » Happy Birthday to my Favorite Auntie! Happy Birthday to my Favorite Auntie! 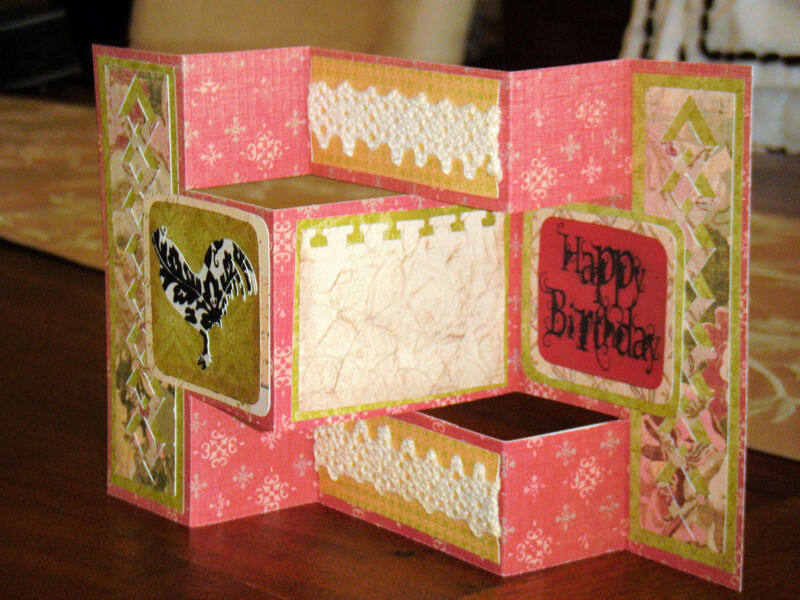 I was trying to find some inspiration for a birthday card yesterday, and came across Kate’s Blogpost about the Trifold Shutter Card. I had seen the cards before and I thought they looked really cool, but I wasn’t sure what to do with them. When I saw her lattice work on the edges of her shutterfold card, I knew that was what I wanted to do. Then, I wake up this morning and Kate is the featured cardmaker on the OWH Stars and Stamps Blog, and the Challenge is to CASE (copy and share everything) one of her cards. I guess it isn’t much of a challenge if I already have the card made, is it? Anyways, thanks for the idea starter, Kate… my aunt is going to love the card! And for those of you who use SCAL with your Cricut, CLICK HERE for the file to cut the lattice. This entry was posted on Friday, September 3rd, 2010 at 10:56 AM	and is filed under Operation Write Home, Scrapbooking and Crafts. You can follow any responses to this entry through the RSS 2.0 feed. You can leave a response, or trackback from your own site. WOW! You did a crazybeautiful job on this!! framing it when I’m not having a “GG” day, LOL!!!! Love you!